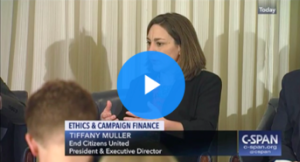 Less than a week after House Democrats introduced the For the People Act, the major reform legislation at the top of the Democratic agenda, End Citizens United hosted a forum with four newly-elected members of Congress to discuss the mandate to pass the bill. Joined by ECU President Tiffany Muller and Cook Political Report’s Amy Walter, who moderated the event, Reps. Jason Crow (CO-06), Antonio Delgado (NY-19), Jared Golden (ME-02), and Abigail Spanberger (VA-07) talked about the 2018 midterm elections, which set the stage for H.R. 1, the For the People Act.